Stone circles are scattered around the country, often in remote locations occasionally surrounded by village developments. There are more than a 1000 of these monuments catalogued in the British Isles and Western Europe. It's thought that the circles were constructed for ceremonial use and today they provide subjects for photographers to explore their creative side. Here are ten you should visit and photograph in the UK. 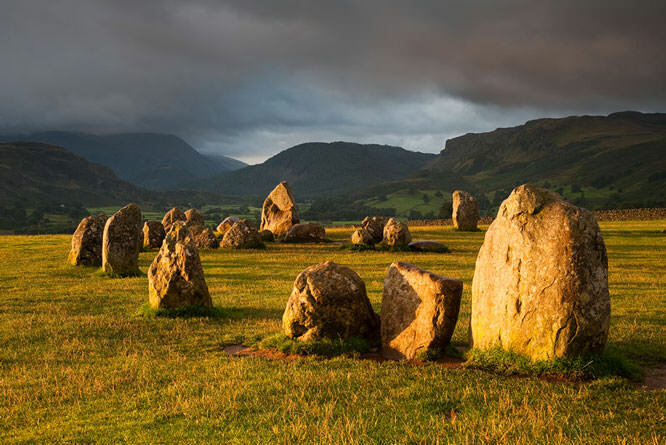 The circle is one of the oldest in Britain and comprises of 40 stones (as stated by the National Trust) in a 30 meter diameter with the tallest stone being 2.3 meters high. With a backdrop of Skiddaw, Blencathra and Helvellyn peaks this is a very impressive location for a very impressive circle. It's best either photographed on a sunny day for clarity of the distant mountains as a backdrop or when there's mist around for an atmospheric alternative. This Neolithic monument is situated in several fields with an inner and outer circle. It's hard to get a shot of the entire circle so pick sections and focus on one of the stones as the main subject with several others tailing off. Choose a day with a bright blue sky and use a polariser to darken the sky to provide incredible contrast and definition. The site is owned by the National Trust but it's currently free to visit. The Nine Maidens, also known as the Seventeen Brothers comprises sixteen stones ranging in height from 0.5 to 0.8m. You have to work hard to get an atmospheric shot of these stones as they are smaller than some, but it's possible, and with a wider angle lens you can frame the whole circle. Shoot from a higher point to get some perspective. Next to a road and loch, but from the right position both can be excluded to get a very dramatic set of shots. Shoot from a low viewpoint to exclude near roof tops. 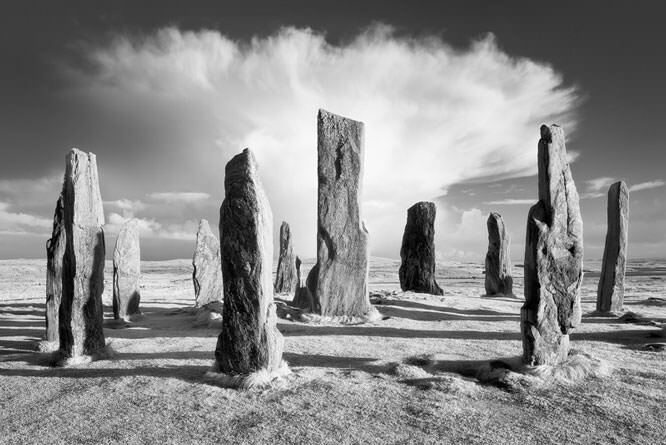 The circle is approximately 13m in diameter and comprises 13 tall and slim stones that are more jagged than most circles and provide opportunities for haunting imagery. A circle of approximately 11 meters diameter made from eight quartz stones placed in a grassy field. The highest stone is about 2.6m tall. The surrounding landscape isn't that interesting for this circle, so shoot from the ground up using a wide angle for most dramatic results. As this circle is situated on Burley Moor, Ilkley, you need to do some walking to get to it so travel light and also do some research with a map first to pinpoint its location as it could easily be missed. It's a ruin with just 12 stones remaining and is in a 16m diameter. The highest stone is 1.2m so you have to work hard to get dramatic results. A distant shot can work better. In a short fall of snow the stones stand out well against the white covered heather. Without doubt, this is the most famous of all the stone circles and looks very impressive, but sadly for photography purposes it's now not possible to go close to the stones and shoot from creative low viewpoint. It's managed by the English Heritage so there's an entrance charge and there's also a small fence rope that needs cloning out from distant shots. But you can walk all the way around and get lots of profile shots and some viewpoints are much more balanced than others. You'll need to use a slightly less wide angle for here - a standard zoom is fine. 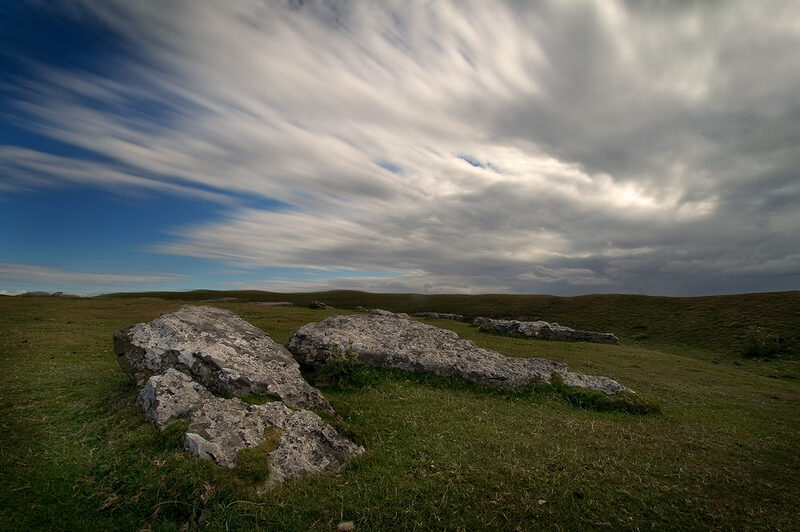 A group of three stone circles situated on the edge of Bodmin Moor, near the village of Minions. It's a group of quite small stones, but several of them are impressive shapes and can make for interesting creative shots. You can walk up the incline onto the moors and photograph the whole circle. The central circle is the largest with a diameter of 41m. You can include distant tin mines in some viewpoints. This would have been a brilliant stone circle but it has either collapsed, or was never actually erected. The stones are arranged in a circle and there is a small entrance fee now in place to get up-close to the stones. Fortunately the terrain, which includes a circular ditch, is such that you can still take some impressive shots and include several stones in one scene. A distant clump of trees on the horizon adds balance to the photo. One of the few stone circles that is well preserved and most likely in its original state. 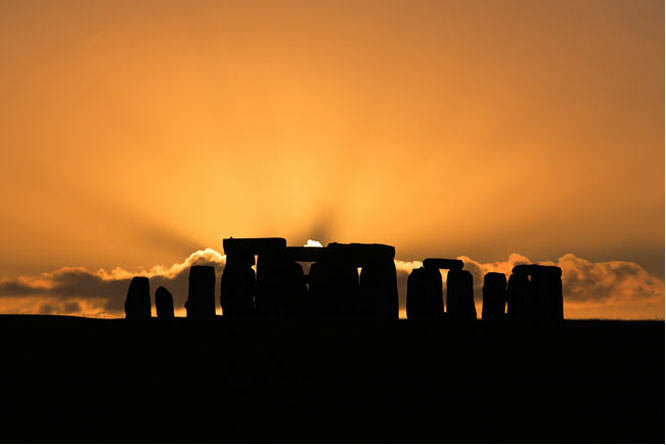 The stones form an almost perfect circle with a 24m diameter and a height of about 1.2m. The shapes of the stones are less interesting than some but the site does offer a fair bit of potential in the right light. Shoot from the ground to make them look more dramatic. It's worth taking a panoramic shot of the whole circle too. I would also add Long Meg & her Daughters, near Little Salkeld in Cumbria and Torhouse Stone Circle, near Wigtown in Galloway (though the stones are small it has a charm of its own).